Dynamic sunset on Cape Ann MA. A fiery ball in the trees. Very pretty shot! 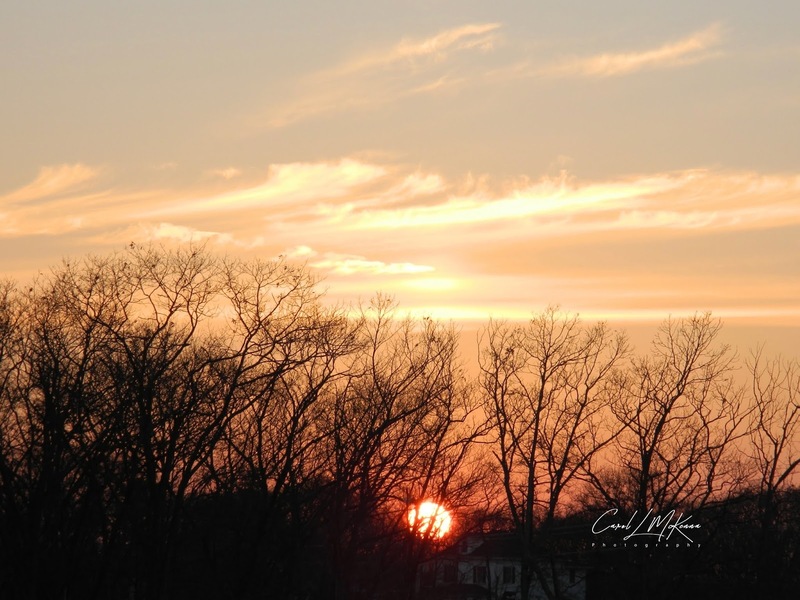 Terrific photos in all your recent posts, Carol, and this sunset shot is breathtaking! I love your unique viewpoint, like the reflection of your adorable dog in the fireplace mirror. I was also very taken with your shadow shot; I am considering a painting series of shadows in landscapes, so need to begin taking and collecting my own photos for reference. Thanks for the inspiration. The rising or setting sun, right on the horizon, is always so lovely. What a nice and peaceful sunset. Beautiful photo, and a beautiful Zoe!
. . . yes it is ! Wow, gorgeous sunset. Happy Friday, I hope your day and weekend is great! What an amazing fiery ball and Zoe! What a spectacular scene you captured. Have a wonderful weekend. fabulous quote, so true!! The sunset is gorgeous!